Anyone who heard Noah Cole deliver an address as Oxford Student Government Association president or talk to the community during a Martin Luther King Jr. Day celebration might think he has aspirations to elected office. He is, after all, a political science major. And Cole will again rise to speak on May 8 as the 2017 class orator at the Emory College of Arts and Sciences diploma ceremony, following the university-wide commencement on the Emory Quadrangle. His topic: the transformative journey of college and the need for students to hold true to the principles and advocacy they learned at Emory as they make their way in the world. The focus, though, isn’t politics. It's policy. Cole was cultivating Emory values even in high school. He was active in student government and embraced the diversity of his native Rancho Cucamonga, a suburban city in California’s Inland Empire. When he came to visit Emory's Atlanta campus, the admissions office suggested he also check out the university's original Oxford campus, 36 miles east. He admired the Gothic revival-style Seney Hall, watched the tight knit student body and was told he could immediately become involved as a student leader. “I was definitely able to pick up my momentum right away and impact change at the ground level,” says Cole, who was quickly elected freshman senator in the Oxford SGA and enrolled in the Pierce Leadership Certificate program. His stint as Oxford SGA president as a sophomore included a speech during the campus’ annual MLK Celebration. A community leader happened to see his brief remarks and was so impressed he invited Cole to give the 30-minute keynote address for the 2016 Newton County Dr. King Celebration. “I have never observed a college student more comfortable, effective and articulate as a public speaker,” says Joe Moon, Oxford dean of campus life, who was in the audience for the 2015 speech that addressed racial progress by also noting the tragedy of the Emanuel AME Church massacre in South Carolina and Cole’s observations during a service trip to New Orleans neighborhoods still struggling after Hurricane Katrina. 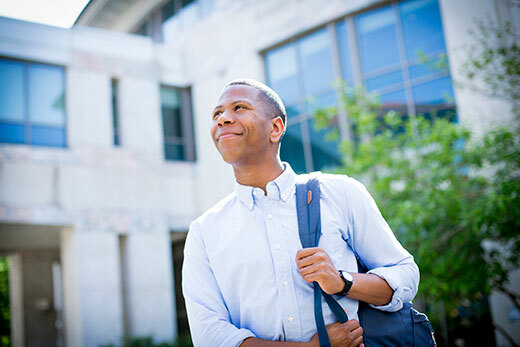 Cole left behind his student government activities when he moved to Emory’s Atlanta campus as a Temple Scholar. He has made the intentional shift to service, both as a senior resident adviser on the Clairmont campus and with the Alpha Phi Alpha fraternity. He also began pursuing internships and other activities that highlighted interests. For two years, he has served on the State Farm Youth Advisory Board, helping to oversee a $5 million budget for service-leaning youth initiatives. Last year, he worked one semester as an intern with CNN’s public relations operations. He spent last summer as an intern in President Obama's White House, participating in community service projects and supervising 30 volunteers on the White House Comment Line within the Office of Presidential Correspondence. He was exposed to professional speakers who advised him and other interns and also learned more about how government works by watching from the inside. But Cole was also fielding phone calls the week when Philando Castile was fatally shot by a police officer in Minnesota and a Dallas sniper killed five police officers. “Being that involved is something than can wear on you emotionally, but that’s why it’s so important to have a strong support network and sense you can make a difference,” Cole says. Cole’s commitment to focusing on the big policy questions has played a role in his honors thesis. His work analyzes “voluntary desegregation,” actions that modern school districts take to ensure diversity of race, income and other factors in their student body. His work shows that all things being equal, it is social capital — that is, the number of nonprofits, churches and community groups in a district — that is most strongly related with the adoption of voluntary desegregation plans, says Michael Rich, professor of political science, who is Cole’s thesis adviser. Not that the audience should expect all seriousness in Cole’s commencement address. The five finalists — selected from a pool of applicants who had submitted their resumes and written speeches — were the strongest Jason Ciejka says he has seen in his five years of heading the selection committee. What set Cole apart in his audition speech was not just his content, but the delivery and emotion behind it, says Ciejka, the assistant dean of the Office for Undergraduate Education.